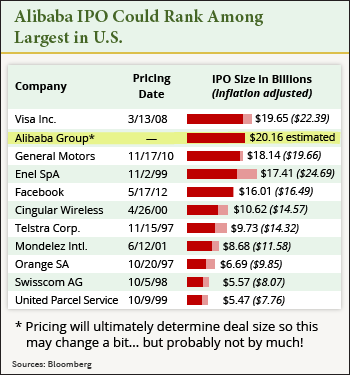 The Alibaba IPO is expected to be one of the largest U.S. IPOs of all time, with some projections placing the deal north of $20 billion. 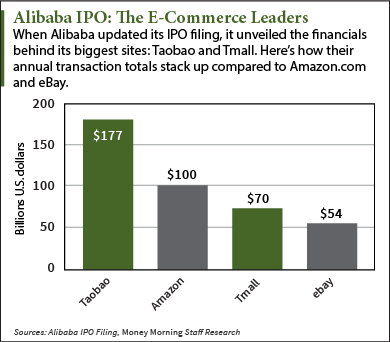 The official Alibaba IPO date has yet to be announced – it may still be months away – but that hasn't stopped investors from looking for ways to begin profiting from the Alibaba IPO now. Alibaba dominates the Chinese e-commerce industry, with 80% of the online transactions in the country taking place on one of Alibaba's sites. According to the research firm McKinsey & Co., Chinese e-commerce was a $210 billion industry in 2012. That number is expected to reach $420 billion by 2020. This week, Alibaba announced that in the quarter ending March 31, it had revenue growth of 39%. In the initial IPO filing, it was revealed that Alibaba had revenue of $5.6 billion for the fiscal year 2013 and $6.5 billion for the first nine months of fiscal year 2014. Net income for those two time periods was $1.6 billion and $3.2 billion, respectively. Alibaba also far outpaces its U.S. competition when it comes to transaction volume. In 2013, Alibaba's biggest site, Taobao, handled $177 billion worth of transactions. Tmall, Alibaba's second-biggest site, handled approximately $70 billion. That compares to $100 billion for Amazon.com Inc. (Nasdaq: AMZN) and $54 billion for eBay Inc. (Nasdaq: EBAY) in the same time. With a company and IPO that big, the profit opportunities aren't just limited to Alibaba stock. Other companies and stocks are already starting to rise as Wall Street notices the profit potential in China's e-commerce industry. Money Morning's Defense and Tech Specialist Michael A. Robinson has been following the Alibaba IPO since rumors first started swirling about the deal in 2013. In February, he pinpointed a stock that had gained 40% in the previous six months and was poised for further growth as the IPO approached.